SACRAMENTO, CA [September 28, 2018]—For a hair-raising experience this Halloween, travelers can check into one of California’s historic, haunted hotels. Several member inns of the California Association of Boutique & Breakfast Inns (CABBI) are known for lingering spirits who have stayed long past their check-out times. Innkeepers have spine-chilling stories to share about their ghostly guests, and one hotel is even the first stop on a popular ghost hunt tour. Room 115 could be double-booked when you stay at the Groveland Hotel near Yosemite. Lyle, a gold miner who met his demise in 1927, appears to have taken permanent residence in the historic hotel. The old gentleman had good taste in lodging, but he might have been a bit eccentric. He is said to have slept with a case of dynamite under his hotel bed. Lyle is finicky about his room and guests have complained that he sometimes moves their belongings; he especially dislikes women’s cosmetics on “his” dresser. Lyle has also been known to turn bathroom faucets on and off and dim the lights if they’re too bright. Lyle’s antics are so well known that when the new owners began extensive renovations to modernize the inn, they left his room—with its floral print wallpaper and marble-topped antique dresser and nightstands—just the way it was as to try to appease their resident ghost. After staying in the 1859 Historic National Hotel in Jamestown, even non-believers have been known to change their convictions about the supernatural. Many guests have shared accounts of doors slamming, lights going on and off, clothing being dumped from suitcases onto the floor, and a woman's sobbing coming from the hallway in the middle of the night. A ghost named Flo is to blame. It’s believed that her fiancé was shot dead by a drunk who had stumbled through the front doorway of the hotel. Flo found her fiancé lying at the bottom of the stairs in a pool of blood by the opened door. For days she sobbed uncontrollably in her room, and then there was silence. The hotel staff found her dead in her room, wearing her wedding gown, presumably having died of a broken heart. Flo's ghost generally stays upstairs in the hotel, favoring the rooms in the front of the building. Although on occasion, early in the morning, she has been seen downstairs, floating through the dining room and right through the walls. Deemed one of America’s most haunted hotels, the historic Queen Anne Hotel in San Francisco was originally built in 1890 for Miss Mary Lake as a finishing school for girls. The building was sold to another buyer nine year later, and legend has it that Miss Mary Lake was not happy about the sale. She’s spent her afterlife wandering the halls and stairwells of the hotel, primping in the mirror on the second floor, and haunting her former room: the Mary Lake Suite, room 410. She makes tapping noises, periodically plays the piano and creates mischief for the hotel staff. Miss Mary’s apparition has been seen so frequently that a popular walking tour, San Francisco Ghost Hunt, begins at the hotel. Check into room four at the MacCallum House Inn and you may have unexpected company. According to Mendocino town lore, Donald MacCallum (born in 1880 as the only son of Daisy and Alexander MacCallum) has never truly left. Many guests over the years have testified to strange and unexplained happenings in room four, where Donald slept from the time he was an infant. There have been reports of dresser drawer handles flipping up and down of their own volition and of ghostly figures passing through the room and other rooms in the main house. Once, a framed picture of Donald’s sister, which had hung for years, fell to the ground and shattered as the general manager was getting supplies out of a storage closet. No one else was on that floor at that time. He went downstairs to get a broom to clean up the broken glass, but when he returned a minute later, a picture of a rooster from a guest room had been hung in the place of the girl’s photo. At the Benbow Historic Inn in Garberville, the fourth floor windows are known to mysteriously open themselves. Staff at the hotel suspect the ghost of a former housekeeper named Sally. Years prior to her passing, Sally had constantly complained about the cluttered desk of a staff member named Teresa, whose office was on the fourth floor. After working late one balmy summer night, Teresa began her ritual of closing and locking the all of the fourth floor windows, turning off the lights and locking the doors. When she returned the next morning, Teresa was astonished to find that all of the windows in the fourth floor offices had been unlocked and opened wide. Yet all of doors to the offices had remained locked. Inside her office, papers were strewn about her desk and it had an eerie chill to it despite the summer warmth. There are no guest rooms on the fourth floor of the inn, but to this day, the windows can sometimes open on their own. 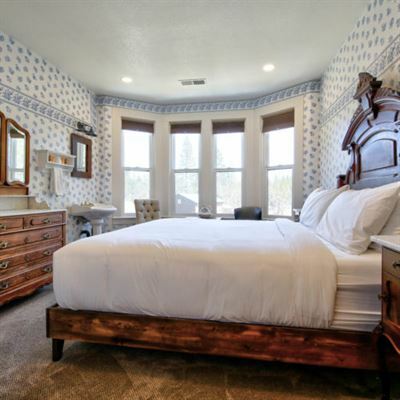 In Chico, the Goodman House Bed & Breakfast was confirmed as having a strong spirit presence by San Francisco Bay area medium and psychic Marge Cuddeback. Before the colonial revival foursquare became a B&B, the house was converted into law offices. Rumors of haunting began soon after the lawyers occupied the building, including one attorney whose desk nameplate was repeatedly thrown on the floor. For more information about the hotels, visit www.cabbi.com.